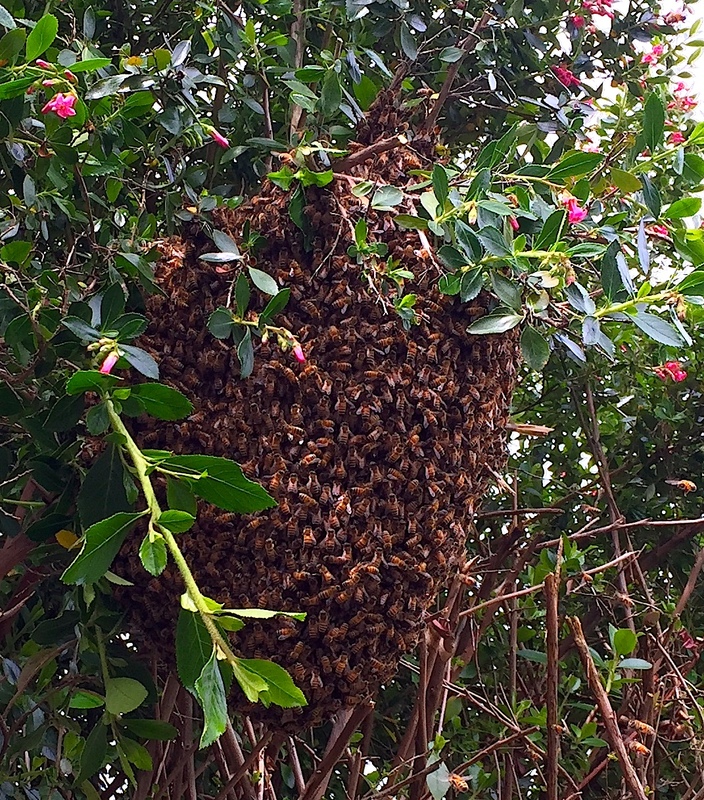 Big Swarm in Escallonia hedge. 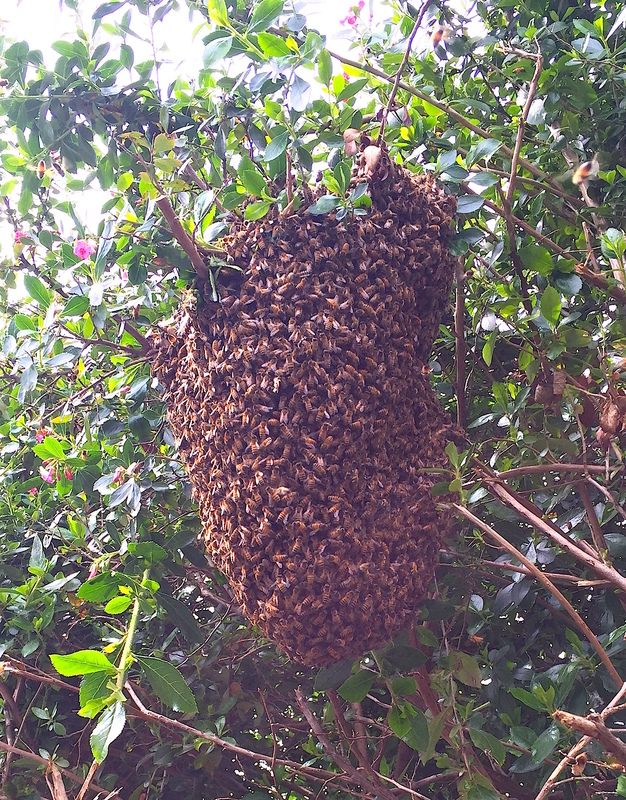 Another look at the swarm after removing some branches. Using a stick of bamboo, I positioned the Steinkraus-Morse Swarm Catcher as close as I could. Steve slowly lifted the branch and yanked it down hard. 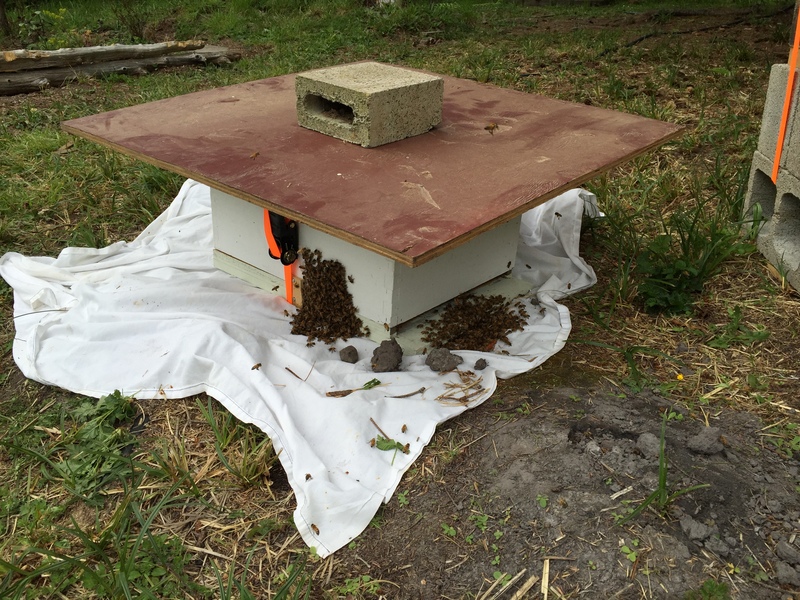 Most of the bees fell into the sack, some missed and landed on the white sheet below. 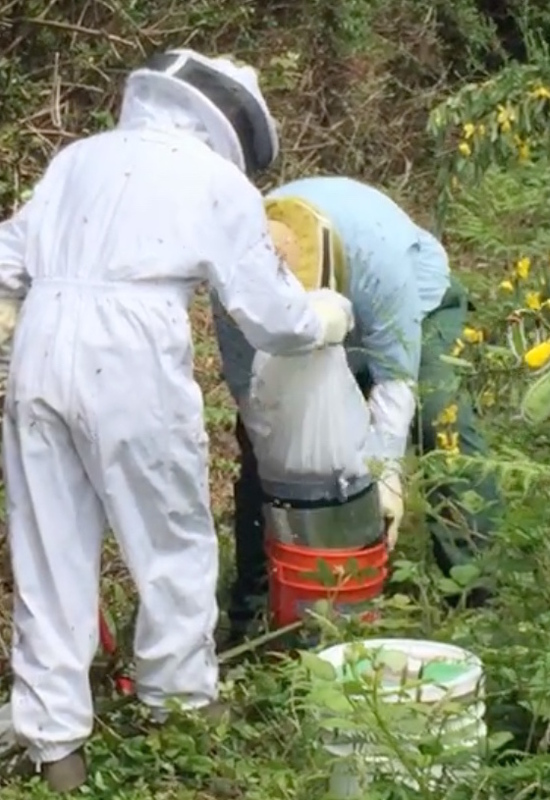 That sack was heavy, heavier than any other swarm I’ve ever caught. 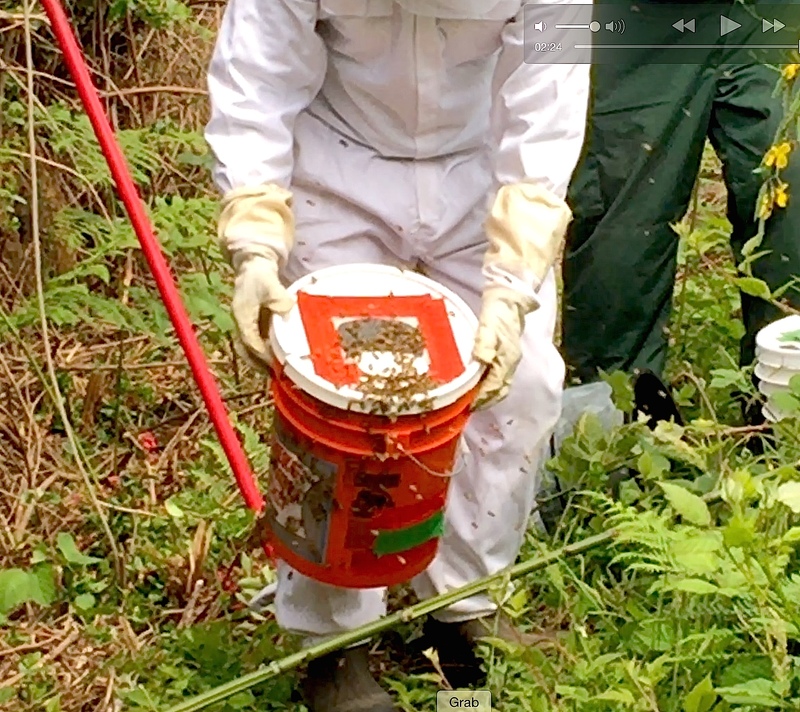 I had to be careful not to crush any bees when I flipped it over into the bucket. 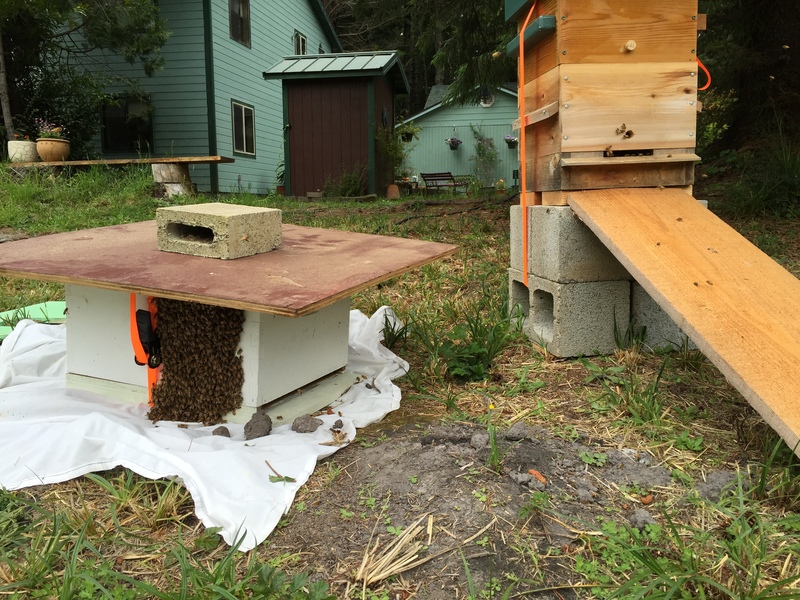 …which I recently built using a vacuum made for a 5 gallon bucket lid. 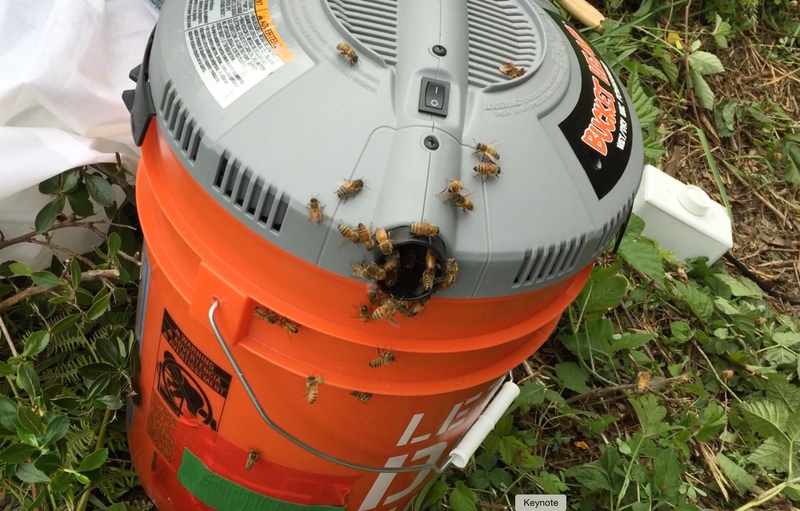 I used a dimmer switch (as seen to the right of the bucket) so I could adjust the suction to avoid harming the bees. 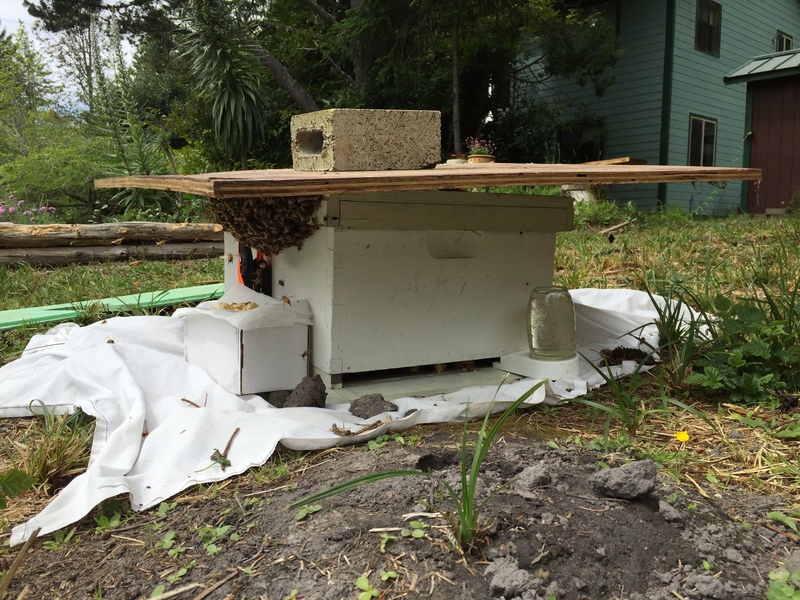 I’m happy to report that no dead bees were found. The dimmer switch worked perfectly. Plans were found at beesource.com . 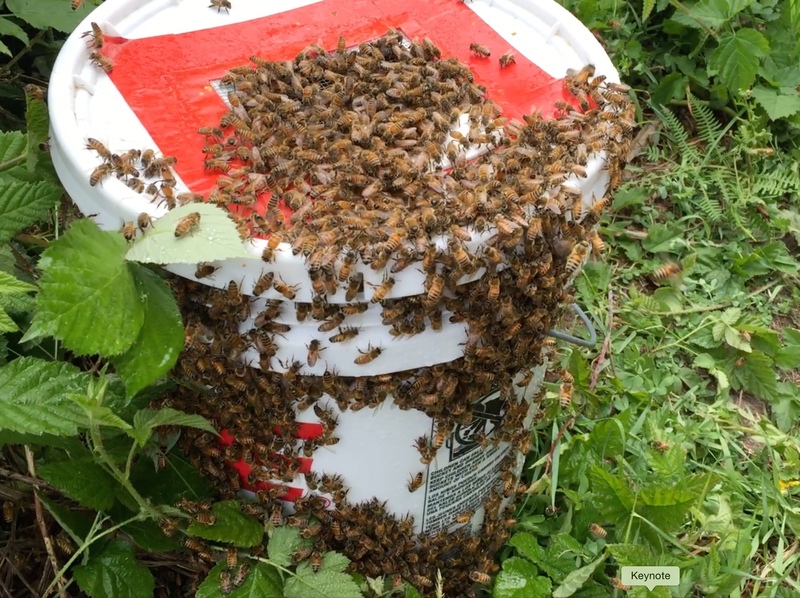 Judging from the bees gathered on the outside of this bucket, I think it’s safe to say, the queen is within. Big Swarm has a new home. 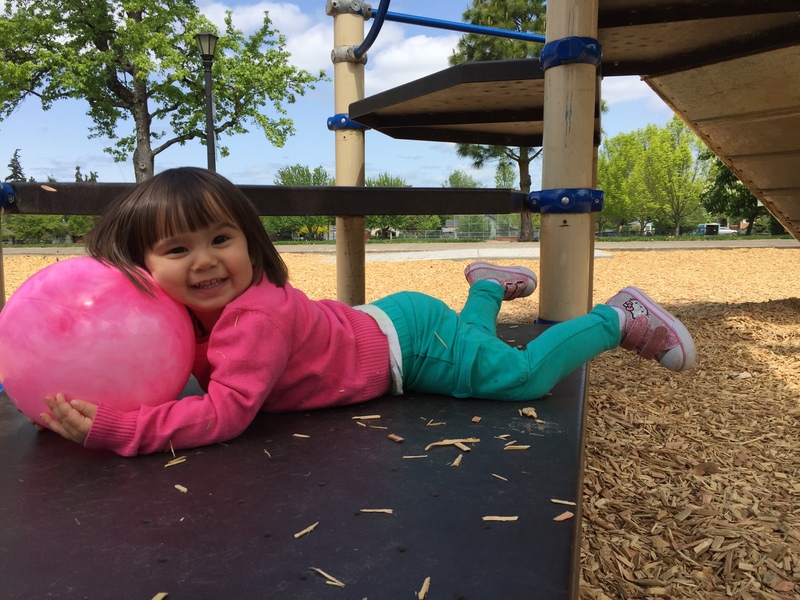 June 18, 2015…Steve writes, “Just an update, “girls” doing well. 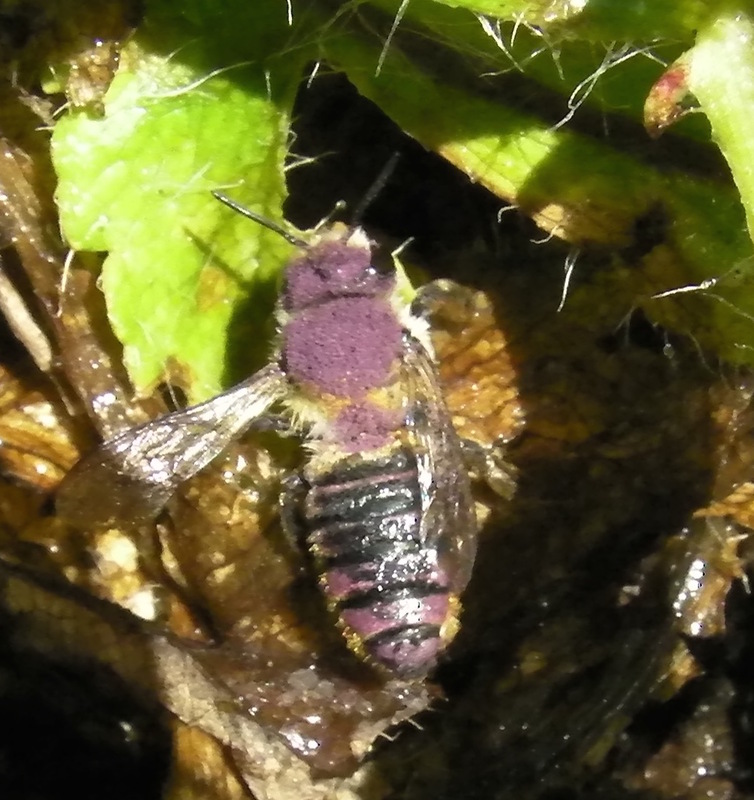 Happy pollinators week! The above swarm worked out well, but it was only after we abandoned our efforts to try to bag the swarm below. 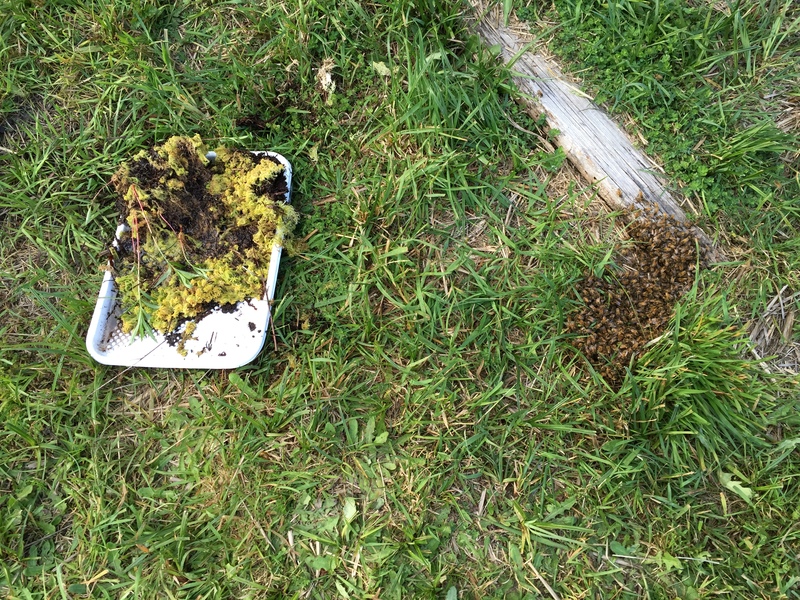 This was a ‘pancake’ swarm,’ lying on the ground in front of a recently occupied Warre hive. Are they going in? It looks like it…but they decided against it. 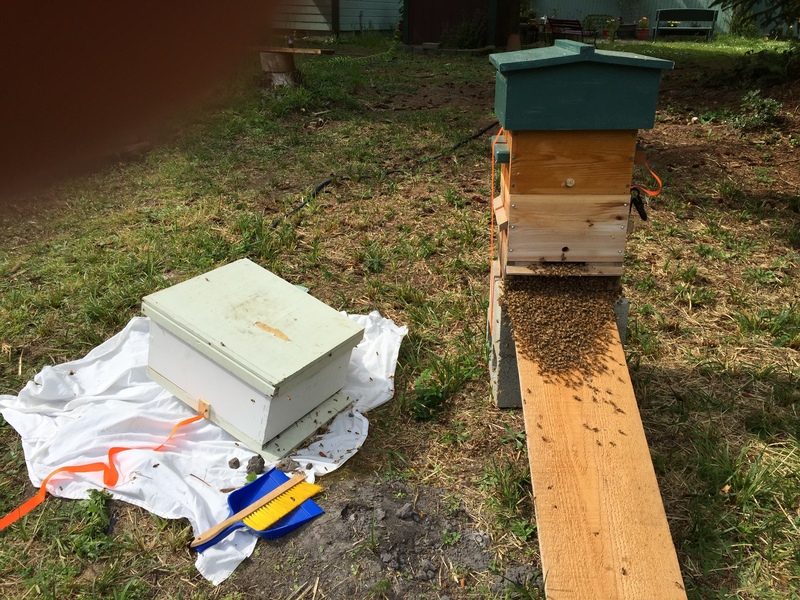 I replaced the bait hive with Steve’s Langstroth hive, then tried sweeping them into a dust pan and dropping it into the Lang…not so fast, they break for the Warre hive. I figured, “okay, they made their choice,” but a couple of hours later, I found them going back to the Lang. 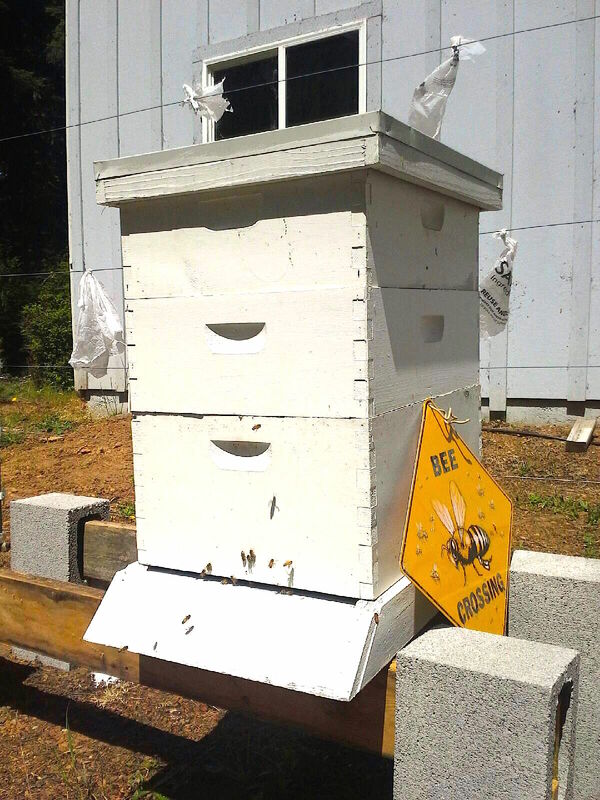 …eventually grouping up on the SIDE of the hive. Since the swarm had been without water or sustenance for a few days, I provided some sugar water to try to entice them into the Lang. 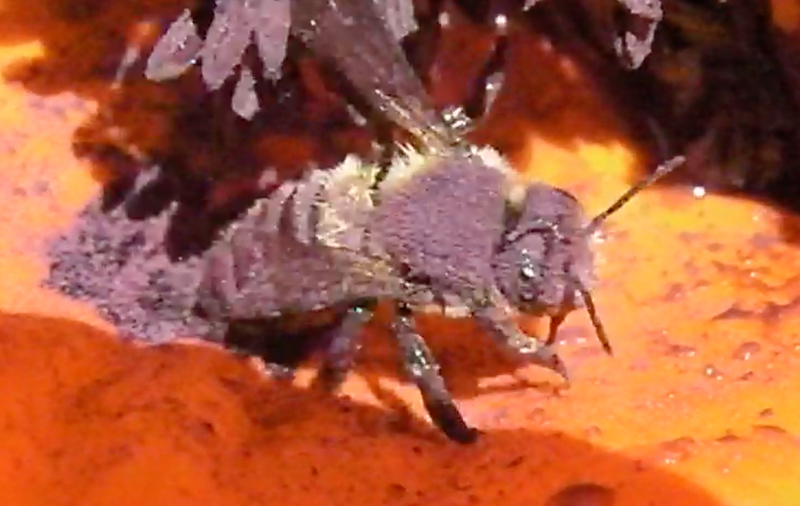 They would have to go into the hive to access the sugar water. That ought to work…it didn’t. 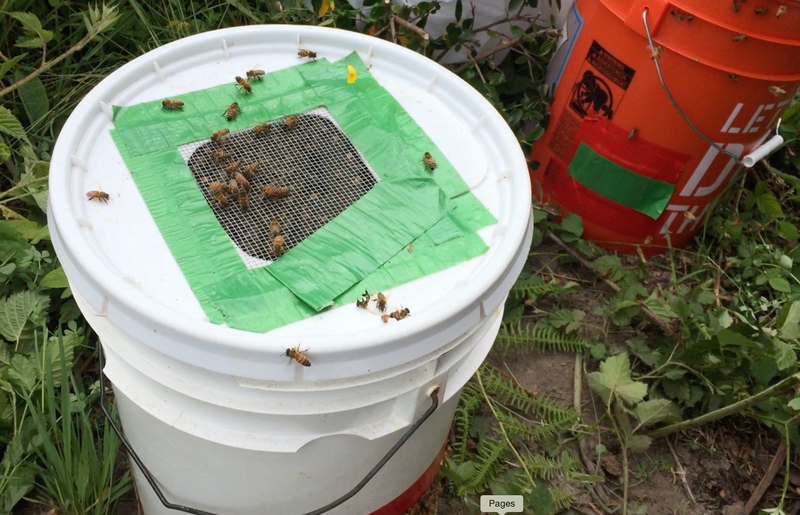 …and an inverted swarm catcher. 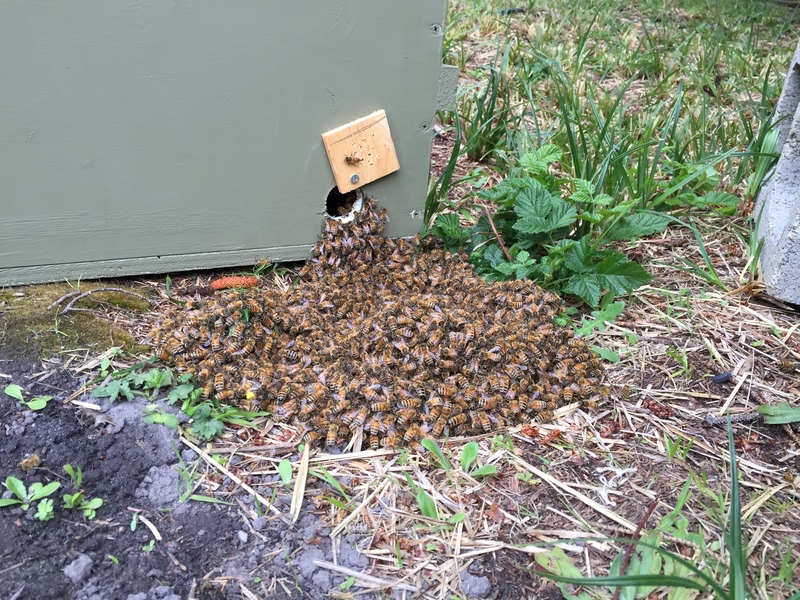 I called Steve saying I didn’t think he would want this little swarm. 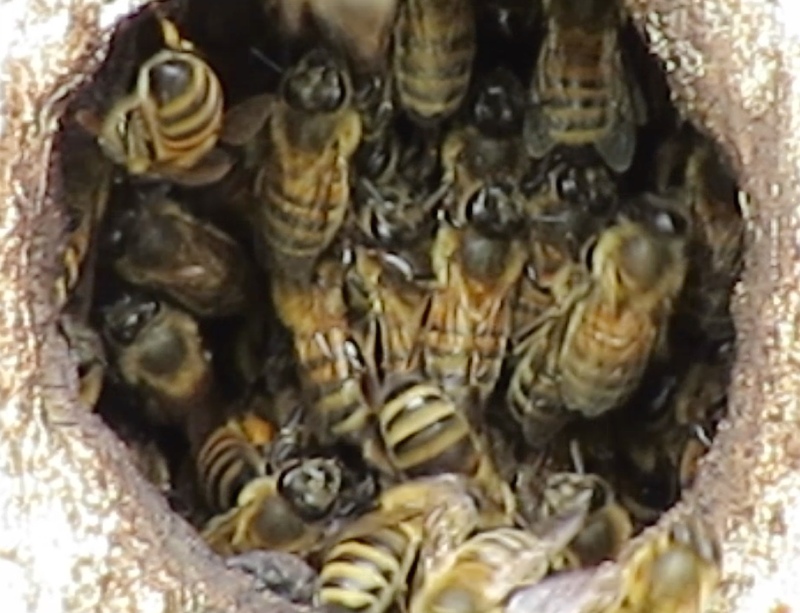 It’s possible that it’s a cast swarm with a virgin queen that can’t fly. 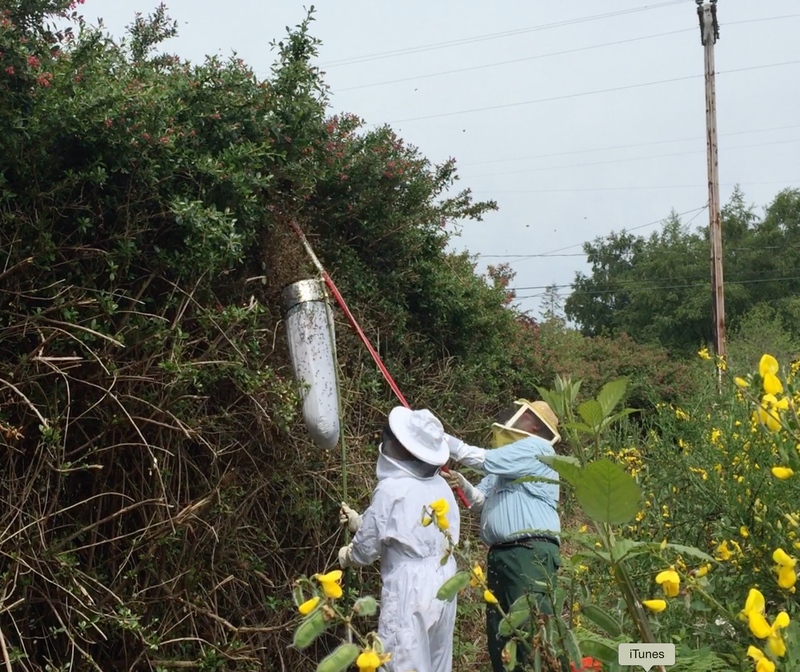 Four days later we get the swarm call for the one in the escallonia hedge. We both agree we’re glad we waited. Where else would you see a sign like this? 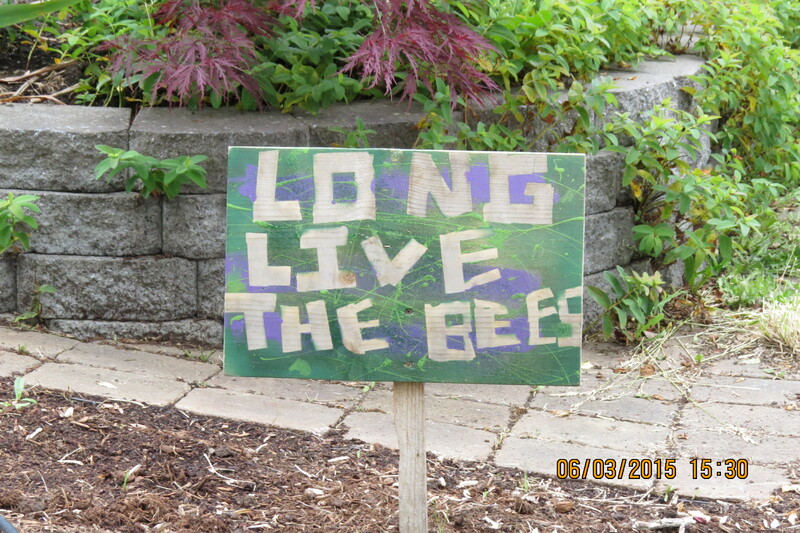 Long Live the Bees! 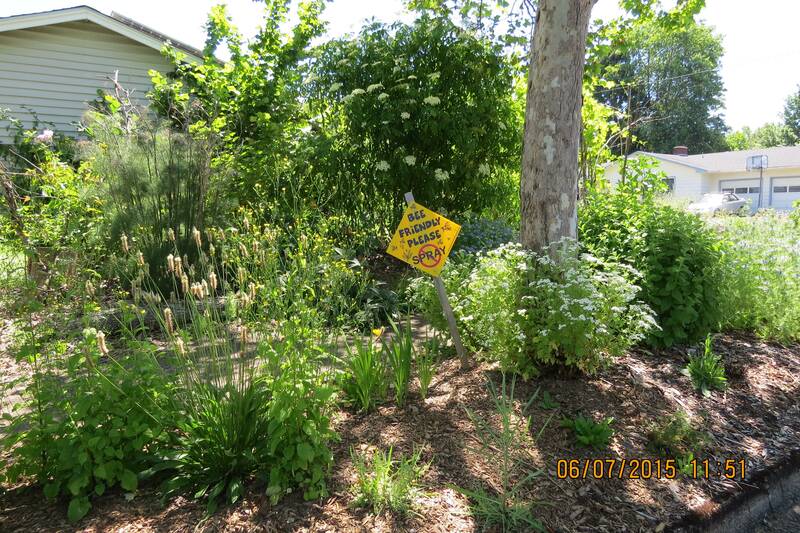 My daughter sent me this photo as seen on one of her walks in the “Friendly Street” neighborhood. When I visited Eugene, I made an effort to find out the story of the sign. 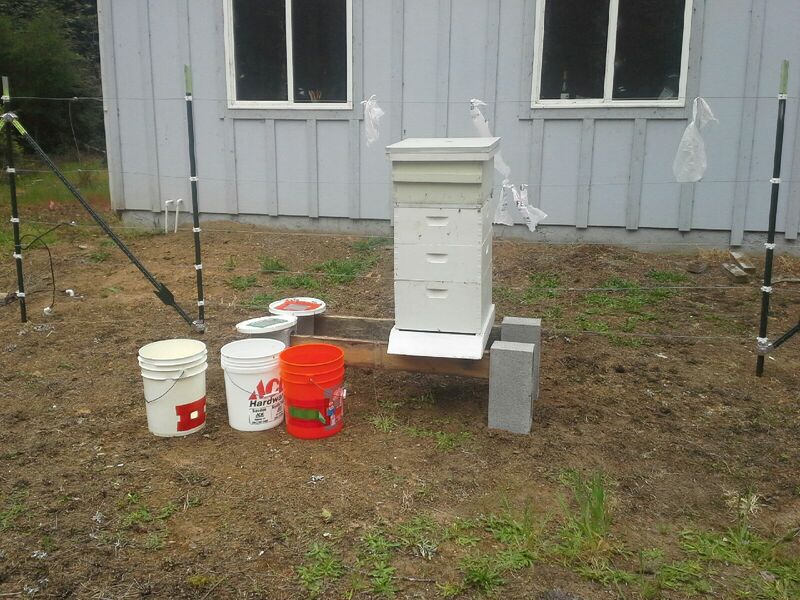 The kids who live here attend the school where Jen Hornaday has donated a bee hive as a school project. 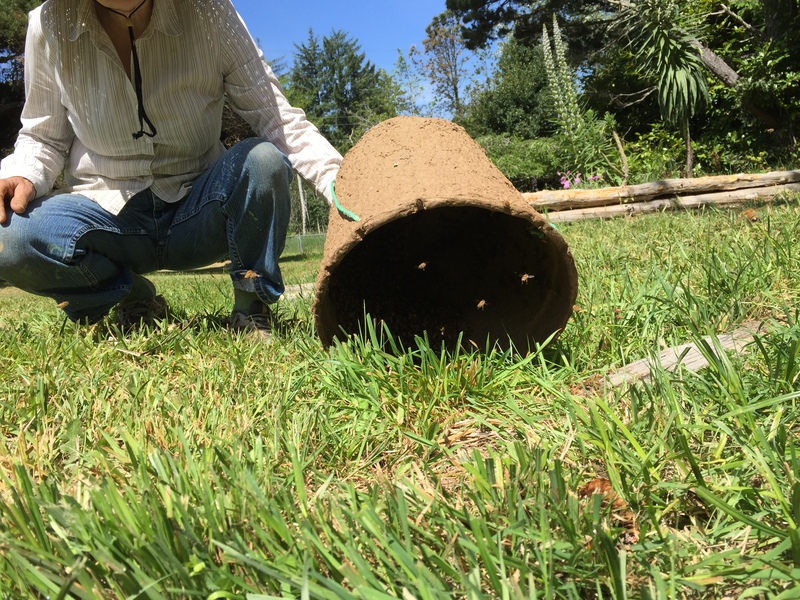 In learning about bees, the kids have found out about their importance in nature, importance to our food supply, and how important it is to grow gardens in a poison-free environment. 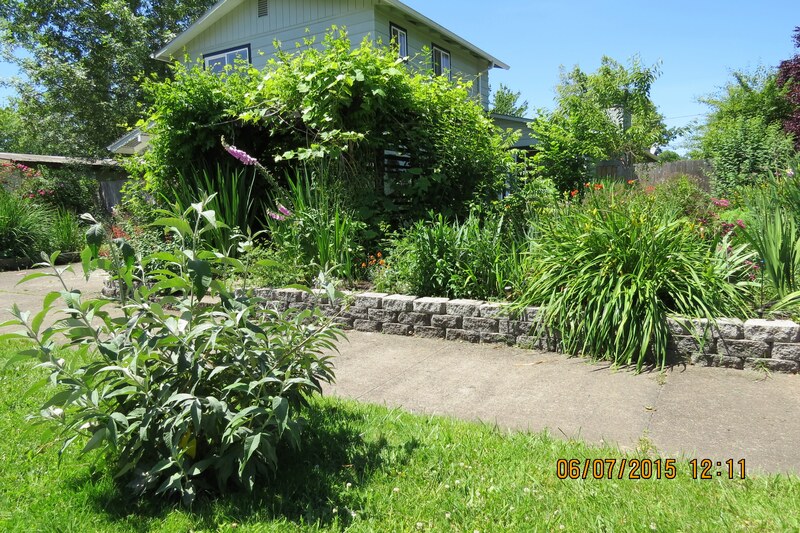 In walking through the Friendly Street neighborhood, I noticed quite a few gardens in front yards. 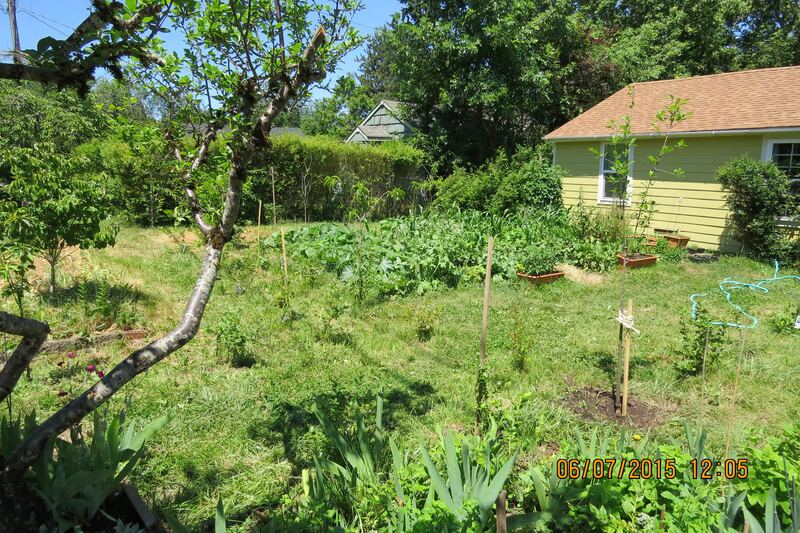 This is Scott’s garden. I was particularly impressed by his ambitious poles for pole beans. I wonder how he will pick the beans at the top. Scott pointed out another of his creations entitled “Coyote eating garden gnome,” sculpted during a wild creative evening of gin. 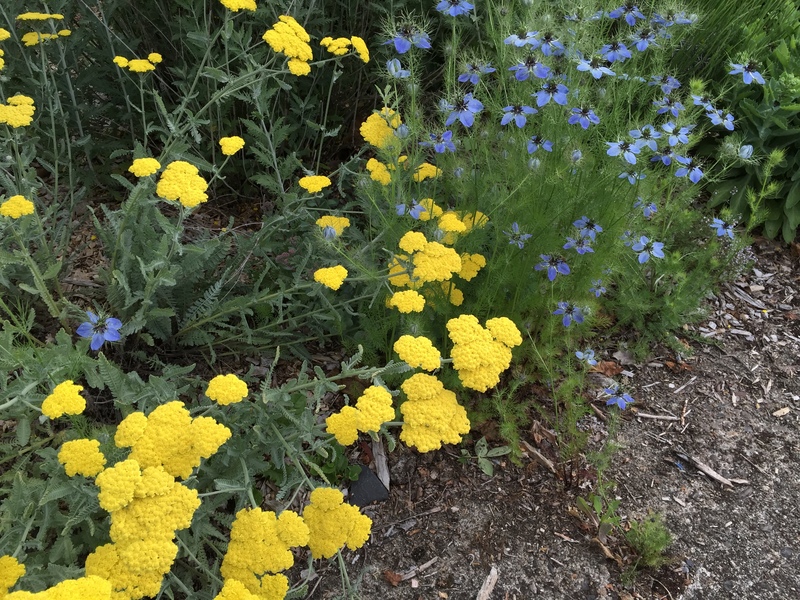 The blue flowers are Black Cumin. Black Cumin seeds are some of the most revered medicinal seeds in history. Photo Credit to Crow Feather Farm, Eugene, OR. 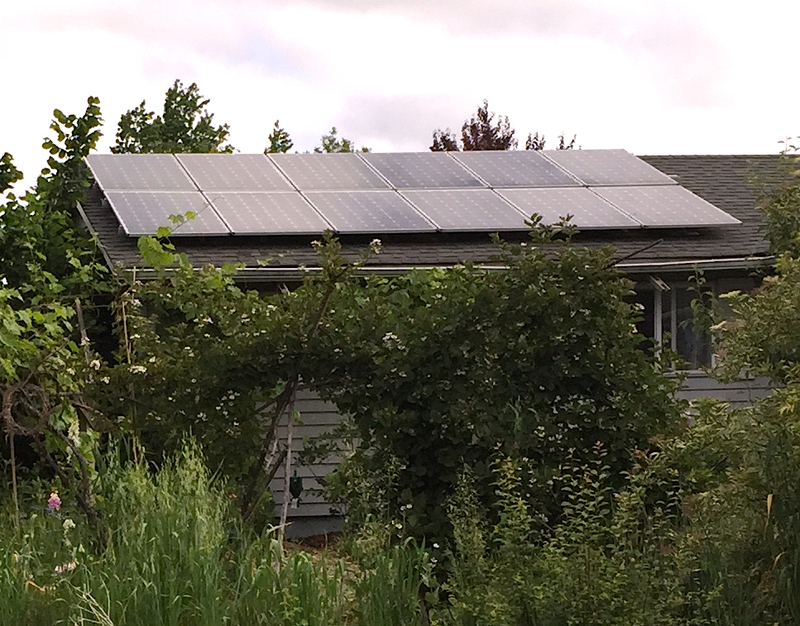 I wanted to ask the owner about the solar panels array, but I was taken by all the flowers and time was short. 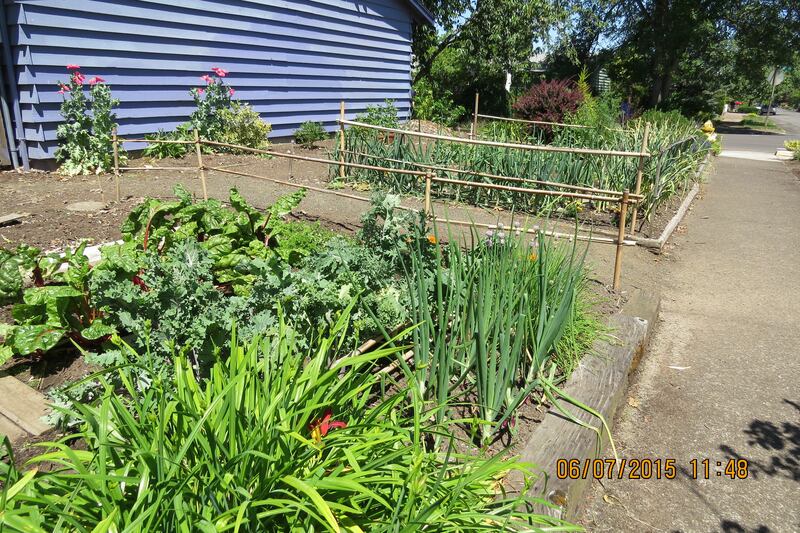 Photo credit to Crow Feather Farm, Eugene, OR. I need a sign like this. Photo credit to Crow Feather Farm, Eugene, OR. 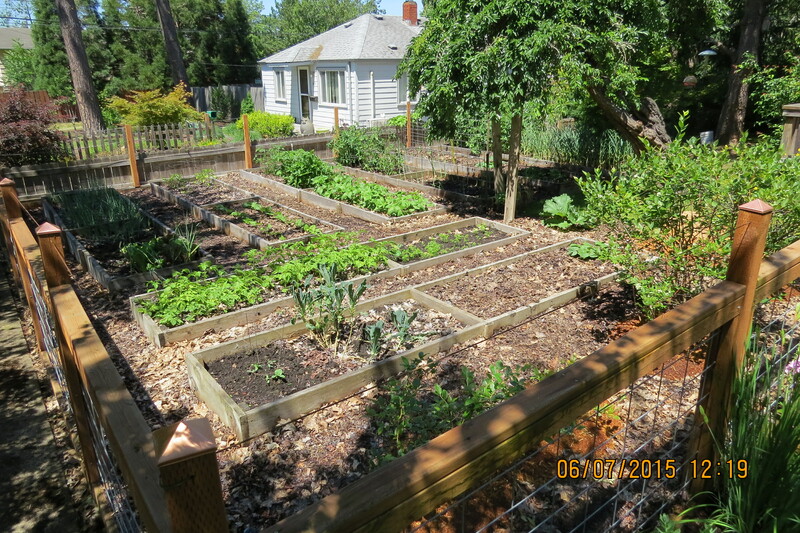 George explained while this is his garden, he shares space with the kids down the street who tend the squash. 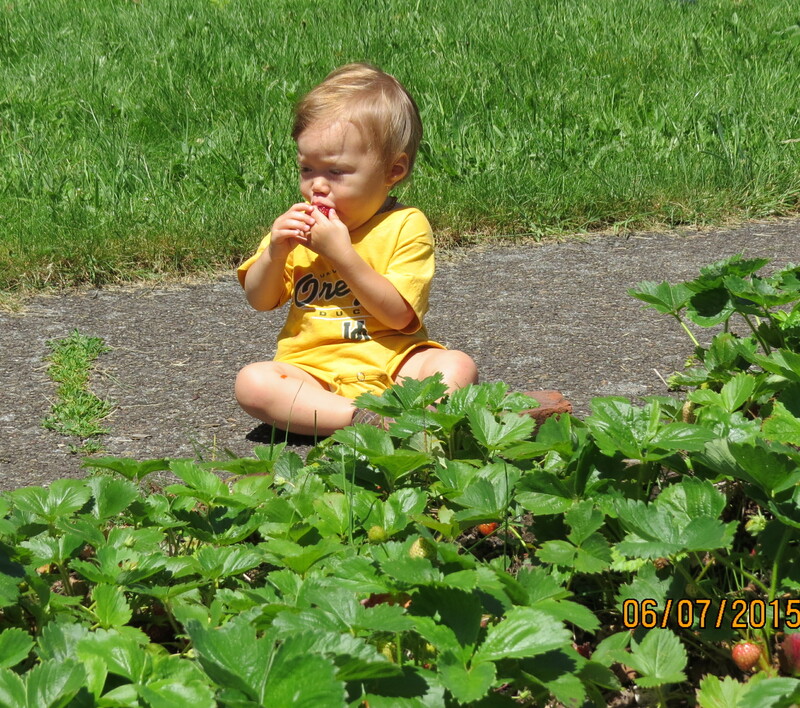 This one year old is intent on one thing only…getting the sweetness out of the strawberry. 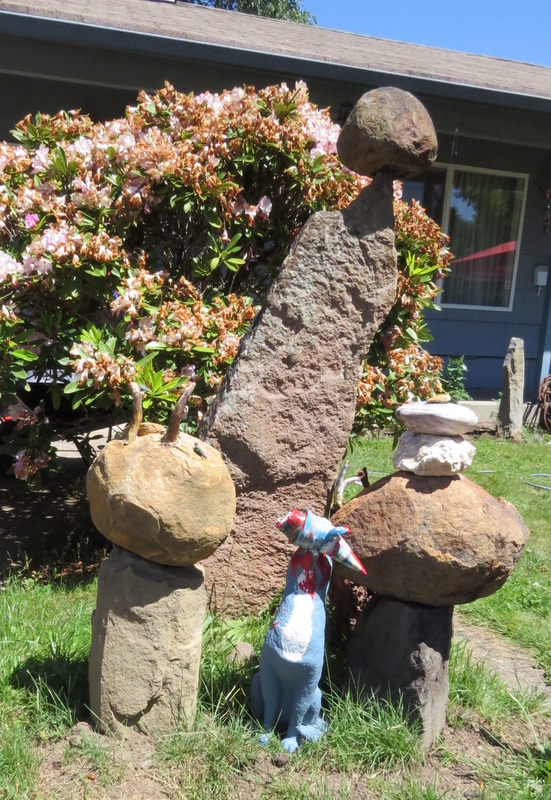 This is Jim’s front yard. He apologized for the fence, but he says it keeps the deer out. I can relate. 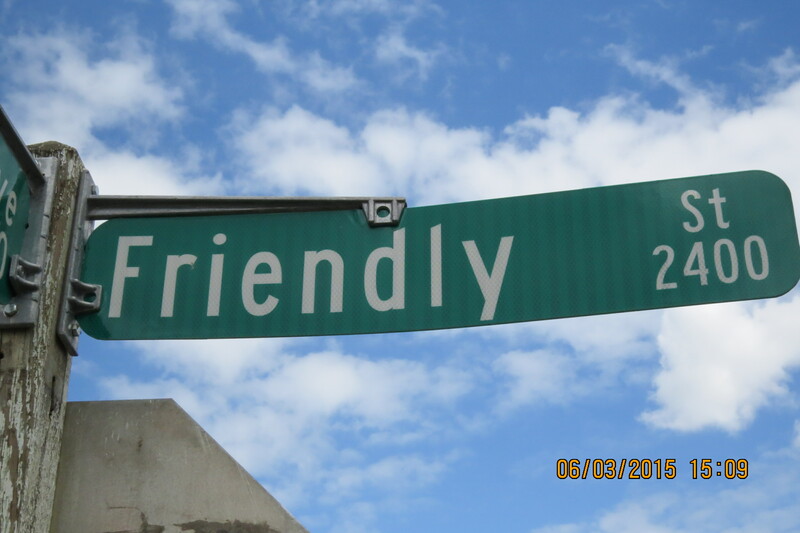 Where does the Friendly Street go? 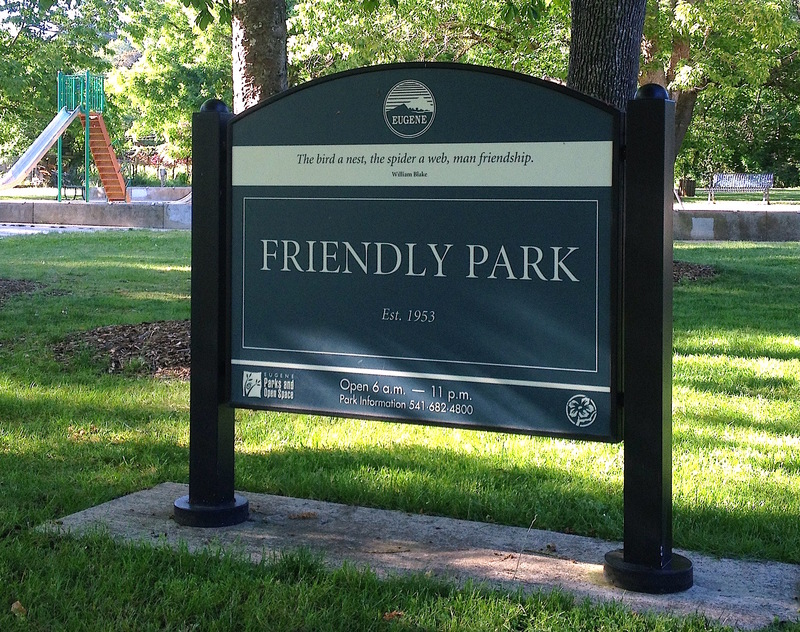 To the Friendly Park, of course, which is how I discovered this lovely neighborhood when my daughter walked us to it. 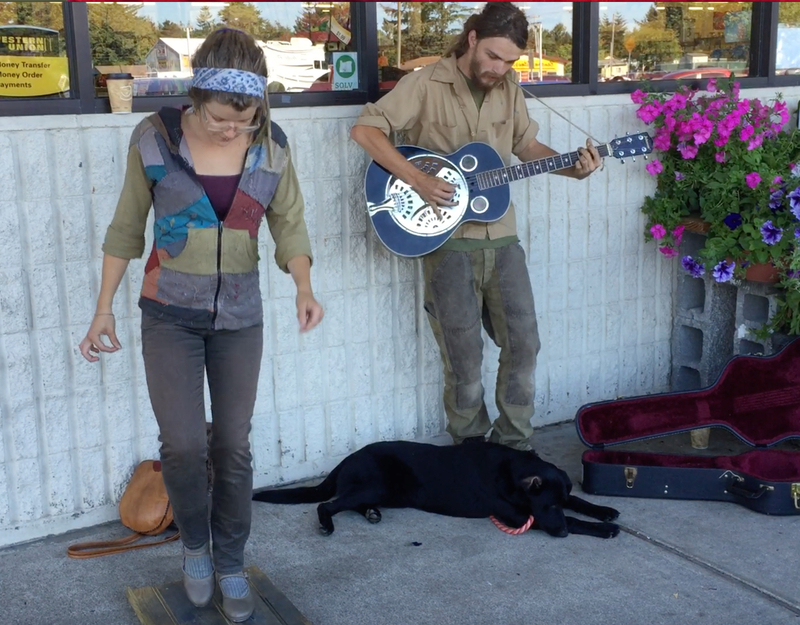 Eugene Bike trails are quite extensive; and it’s a great place to live. 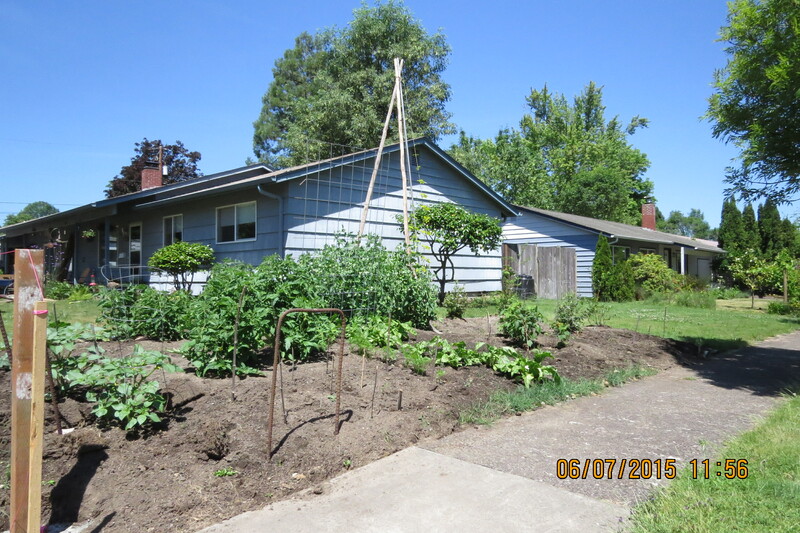 May 31…The Bee Garden is shaping up after Sue added her brick work. We like it so much we’re going to add more on the other side. 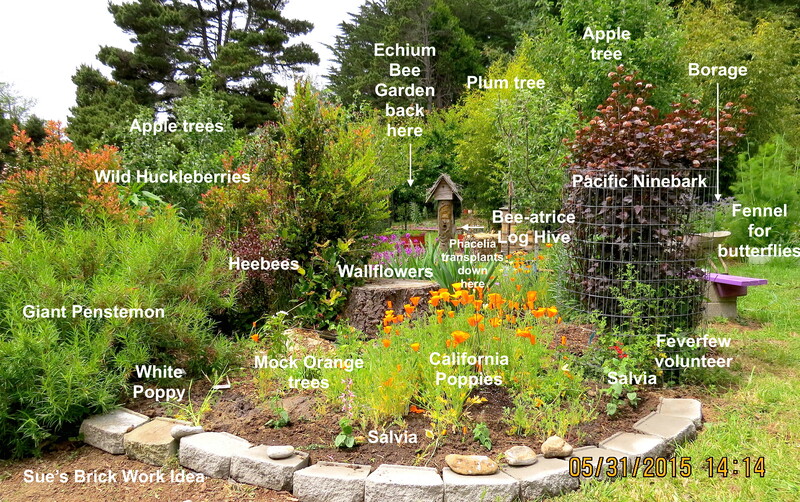 The photo shows just some of the bee-loving plants we’re growing…some from seed, some from our favorite nursery. 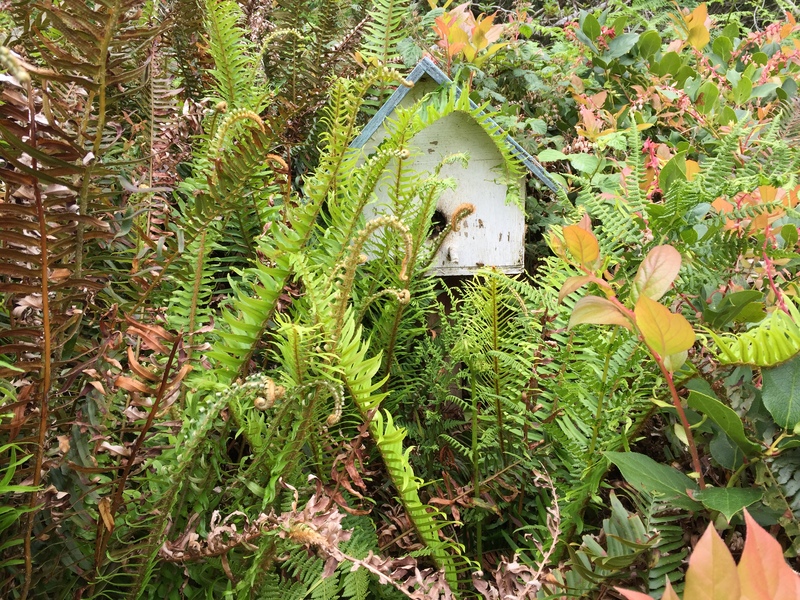 I just noticed these ferns practically overgrowing the little Birdhouse Bee hive. 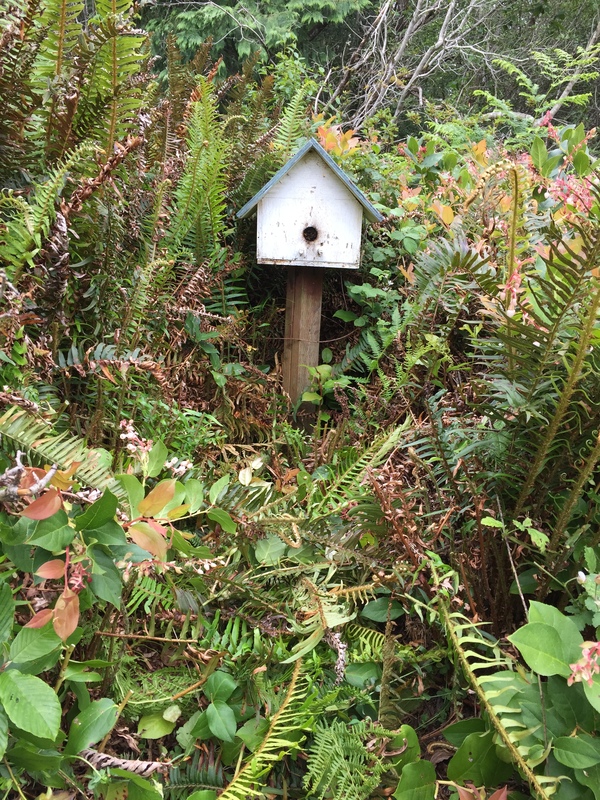 I successfully trimmed the ferns without getting stung. The bees probably don’t care one way or the other, but it gives me a clear shot with the camera. 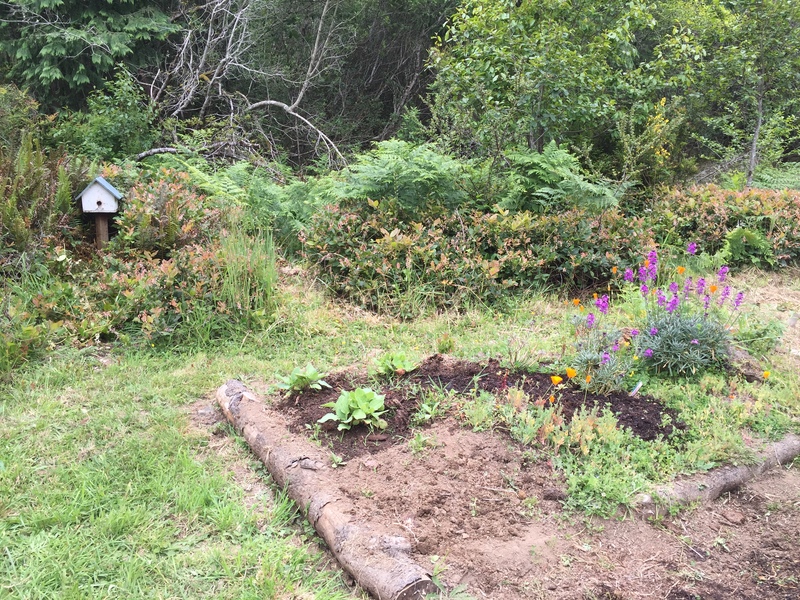 May 31…The hugelkulture bed needs a little more work for sure. This is a ‘before’ picture. I’d like to make a little path going past the hive and circling back past the sunflowers I just planted (if the slugs don’t eat them first.